Carbon fiber sleeves are gaining in popularity among quality-conscious flexographic printers as the advantages gained in using the advanced designs outweigh the shrinking front-end investment. 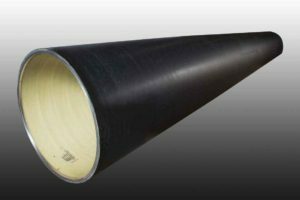 MECA Solutions produces an array of carbon fiber sleeve strengths that its customers increasingly are choosing over traditional steel sleeves. MECA’s carbon fiber sleeve options include low-modulus, standard-modulus and high-modulus carbon fiber material. The modulus of the material refers to its structural strength and is determined by several factors, including the type of fibers used. The resin and winding angles at which carbon fiber is wrapped onto the mandrel also affect the modulus, with the combination providing the differentiating factor that varies the strength of the sleeve. MECA can provide carbon fiber sleeves in a variety of wall thicknesses to meet deflection or dimensional needs. MECA offers steel and carbon fiber options for flexographic printing rolls, mandrels and sleeves. Its carbon fiber sleeve options include bridge sleeves and VSOP sleeves. Additional coatings needed for steel sleeves, along with a reduced cost for carbon fiber products, are shrinking the price difference between the two materials. Steel sleeves require an expensive chrome or nickel plating to keep them from rusting, while carbon fiber sleeves do not require an additional coating to maintain a vapor barrier. Contact MECA to discuss which carbon fiber sleeve strength is appropriate for your application. MECA Solutions is North America’s premier manufacturer of high-precision cylindrical products for the printing and web handling industries. Included in MECA’s product offering are flexographic print sleeves, heat transfer rolls, carry rolls, mandrels, coating rolls and other specialty roller products. MECA utilizes a variety of materials such as steel, aluminum, carbon fiber and other substrates to manufacture its precision products for the industrial printing, coating and web converting industries. For more information about MECA Solutions’ design and manufacturing capabilities, contact Tim Olson, sales manager; Phone 920-336-7382, email: [email protected] or visit https://www.mecagb.com/. View original article on carbon fiber sleeve here.